Some of the older ones remember October 27 as Navy Day. Before unification of the services in 1947 each service had their own day to celebrate each year. Since then we all celebrate Armed Forces Day together on the third Saturday in May. But Lowry held on to Old Navy Day and for a reminder, she gave a special performance when she deployed in the Caribbean during the Cuban Crisis of 1962. Lowry was operating as a unit of Task Group Alfa which was an ASW Ready Group consisting of Randolph (CVS15) and assigned DDs operating out of Norfolk. In late September we went out of our usual operating area off the Atlantic Seaboard to the Caribbean for a special three week ASW training and surveillance period. Our return to Norfolk was delayed in order to avoid a hurricane along our homeward track. While approaching the Virginia Capes on the night before our scheduled morning arrival in Norfolk, President Kennedy went on the radio to the Nation and announced a naval blockade of Cuba. Less than an hour later, Task Group Alfa was ordered to change course to 1800 and 25 knots until further notice. We were short of fuel and food supplies but it was not long before an oiler and supply ship reached us on station around Cuba where we settled in for an indefinite period. Lowry was the only ship at the time in the Atlantic Fleet fitted with a variable depth sonar (VDS) 250'. By using our bathermograph (BT) we could measure the depth of the thermal layer and lower the VDS transducer below it to pick up contacts that would otherwise be protected from detection since the conventional hull mounted sonar could not penetrate the thermal layer. 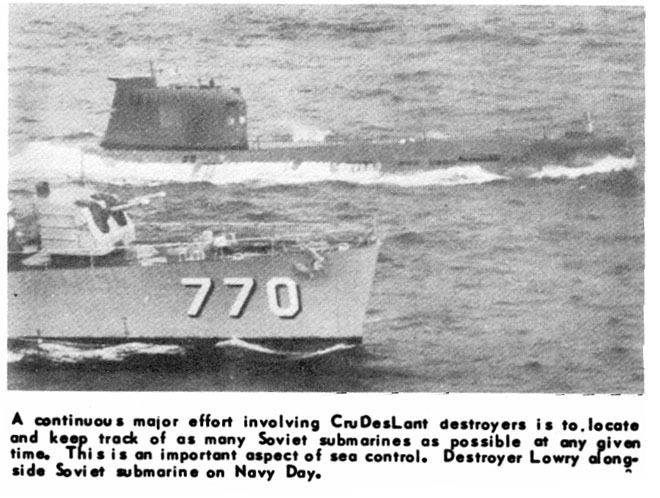 After some days on station ASW planes from Randolph and the assigned DDs were searching for Russian subs known to be in the area. October 27 was dull and overcast with rain squalls and a choppy sea when one of the S2F planes picked up an intermittent sonar contact toward the end of the day. Lowry and Stormes (DD780) were sent to investigate the contact, then some 40 miles distant. On approaching the contact area, Norman Tarbell RD3 was on the SPS10 radar. He detected a faint blip fading in and out at extreme range which he evaluated as a possible surface contact. As we headed for it, the contact soon disappeared. We thought this could be a sub on the surface that detected us and then went down. We continued on in that direction and let the VDS down below the thermal layer and immediately gained sonar contact. Lowry and Stormes then set up a holding pattern and the sub was not able to break contact. After sunset it became very dark for a few hours before moonrise. During this period of darkness LTJG Frost, the ASW officer reported heavy turbulence around the contact indicating it was de-ballasting and preparing to surface. In order to avoid hostilities the United States had previously advised Russia to instruct their subs when surfacing to do so on an easterly heading of 0900 and at night to show running lights and identify itself by signal searchlight on breaking surface. Out of a very black night, all of these conditions were quickly met. Lowry and Stormes then took station on each side of the sub and proceeded slowly on an easterly course. The next morning interpreters and photographers came over by helo from Randolph to talk by bull horn to the sub while close alongside. We steamed along taking photos of each other but little information was obtained. 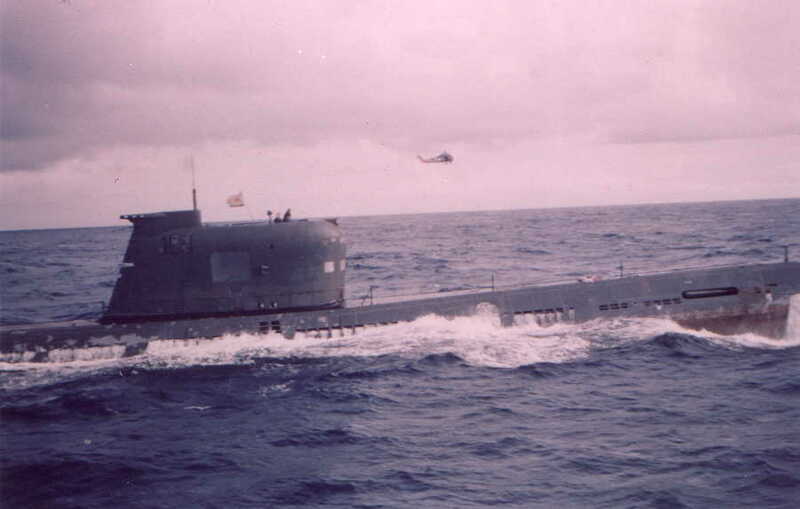 We stayed with the sub for 36 hours until it was well on its way home before rejoining the task group. Although I spent other Navy Days at sea, this is the one I remember the most and one that Lowry never forgot.